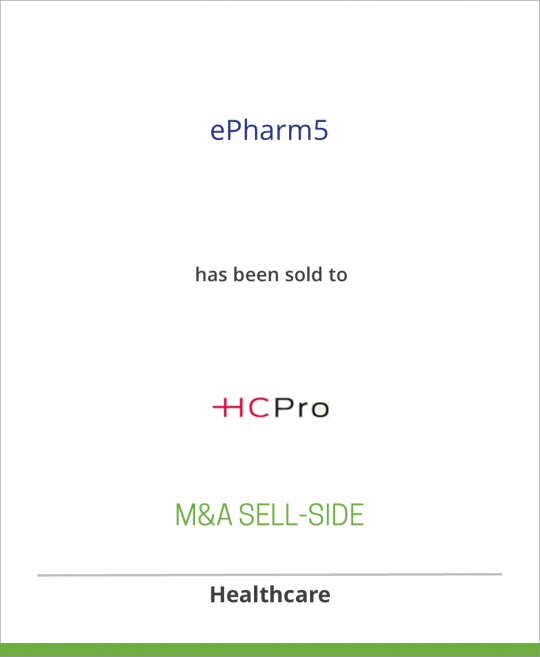 Medical Broadcasting Company has sold ePharm5 to HCPro Inc. Founded in 1991, Medical Broadcasting Company (“MBC”) has pioneered the use of new media and technology to serve the strategic and communications goals of our clients – from the world’s largest pharmaceutical companies to promising biotech start-ups. MBC was started by David Kramer and Linda Holliday and is located in Philadelphia. With more than 17 years of experience, HCPro, Inc. is a leading provider of integrated information, education, training, and consulting products and services in the vital areas of healthcare regulation and compliance. The company’s mission is to meet the specialized informational, advisory, and educational needs of the healthcare industry. HCPro provides its specialized information in a variety of products, including newsletters, books, videos, audioconferences, training handbooks, e-mail newsletters, and online courses. As an acknowledged industry authority in healthcare regulation and compliance, HCPro focuses on providing its clients assistance and expertise in the areas of accreditation, medical staff affairs, credentialing, privileging, medical record management, regulatory compliance, nursing, quality/patient safety, infection control, and workplace safety.